There is a perverse incentive in research that it is not in a scholar's interests for a problem to be solved. If your pet problem is solved, what do you do next? Therefore, publishing a UK book on European patent litigation in the year of the Brexit vote can be surprisingly fortuitous and lead to interesting reading. Brexit adds an (un)expected plot twist to the development of European patent litigation, and Luke McDonagh's new book is possibly the prequel to whatever-comes-next. The book has three main chapters; one chapter looks at European patent litigation under the European Patent Convention, and includes a comparative analysis of key jurisdictions. Another chapter examines the UPC and Unitary Patent reform packages. The book provides a lot of practical information in its examination of litigation in the UK, Germany, France and the Netherlands. In Chapter 4, the author reports on a survey of the UP/UPC-interested legal and business communities. Interviewees were predominately UK-focused. Here a discussion on renewal fees, perhaps one of the more interesting economic levers of the UP, suggests that the community prefers renewal fees to be set at the equivalent of three member states existing fees (namely the UK, Germany and France.) However, this view was not unanimous, as one interview noted that, "her company 'would like to see a higher renewal fee because higher fees discourage spurious patenting.'" [Merpel thinks this interviewee is very economics-friendly.] Other sections address trolls and forum shopping, the opt-out and SMEs. At the time of writing, the UK IPO has not changed its stance on the UPC. Time will tell. 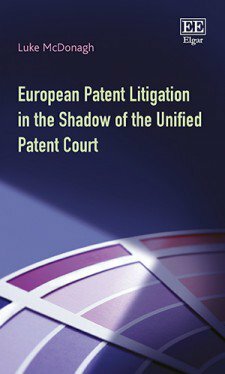 European Patent Litigation in the Shadow of the Unified Patent Court, by McDonagh, Luke. Cheltenham: Edward Elgar Publishing, 2016. ISBN: 978 1 78471 473 4. Available here for £70. Rupture factor: Low, a back-friendly 200 pages. Disclosure: In my previous role at the UK IPO, I was involved in the underlying research project discussed in the final chapter.